Two years ago I tried to catch a grayling at Yellowstone. I hiked 7 miles and got skunked. So it was with shaky confidence that I decided to try it again this year. While my son and daughter-in-law hiked the Mt Washburn loop, I decoded to give Grieb Lake another try. The trail rolls through burn-scarred forest. It takes about an hour to cover the three plus miles. Grieb Lake is a lovely small lake. Many people make the hike just to see the lake, or use the trail as the first leg of a longer backpacking trip into the areas of the park off the beaten path. When I pulled into the parking lot, there were three rigs sitting there. Before I collected my stuff to hike in, a guy with a large, heavy backpack with attached spinning rod returned. He reported that his trip was outstanding, but in two days he caught only one small rainbow. Hmm. About a mile in, I passed a group of three men hiking out. Three days they had camped and fished. Grand total of fish – zero. Hmmmmmm. But they did have a bugling bull elk walk between their tents. As I approached the lake, I spotted an older couple sitting on a fallen tree. No fishing gear, just day hikers. They watched a pair of swans cruising the lake. We shared our opinion of the weather and the normal trail chatter. I continued on around the lake; they went back to their car. I had the lake to myself. Now I have to say I don’t fish a lot of lakes. I’m more of a small stream kind of guy. The problem I have with lakes is that it all looks the same. Give me a current seam or eddy or riffle or plunge pool. But a lake, the fish could be anywhere. I circled to the far side of the lake. It was sheltered from the wind and there was a cove that looked inviting. For the next two hours I did lots of casting without any catching. I started with dries, then nymphs. Finally, I put on a cream soft hackle on a greased line. Then I spotted a rise. Dropping my fly right on the center of the ring, I caught my first grayling. A pretty little fish with a great big sail. Over the next hour, I caught an even dozen grayling and two small rainbows. Then the rises stopped and the catching stopped. 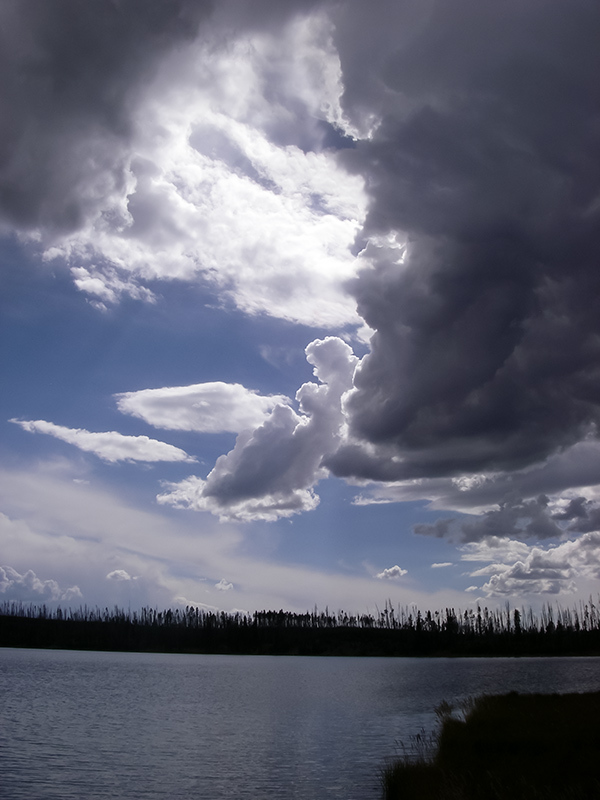 With threatening clouds, I headed back. 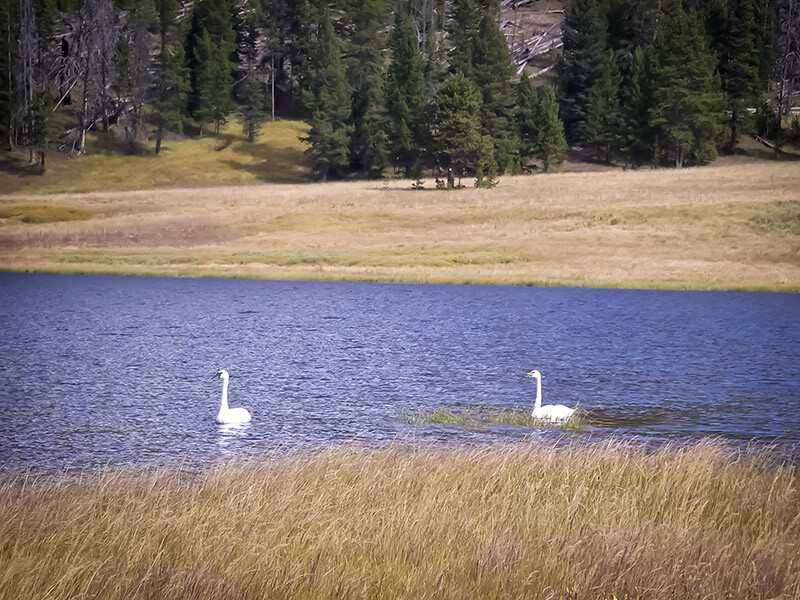 The pair of swans still paddled around the south end of the lake. As I started down the trail, I mentally checked another item off my fly fishing list of things I really want to do. 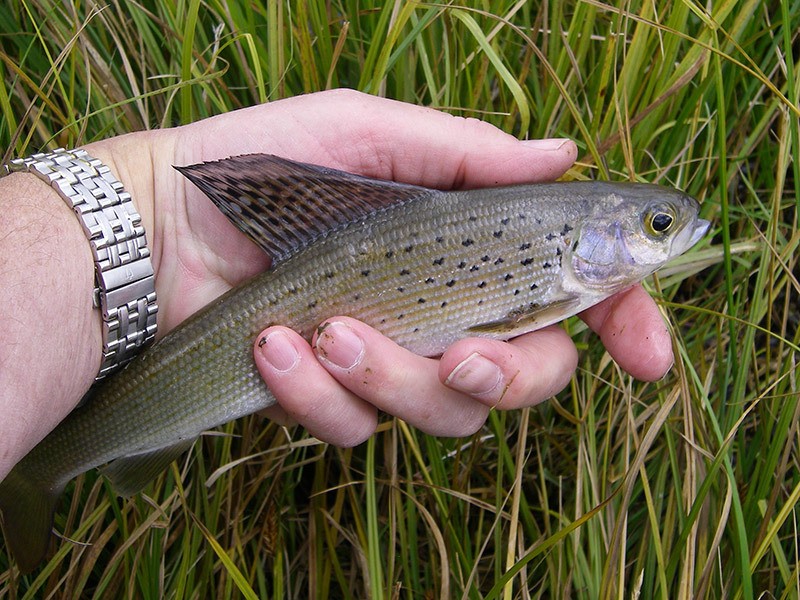 Catch a grayling – – Check.